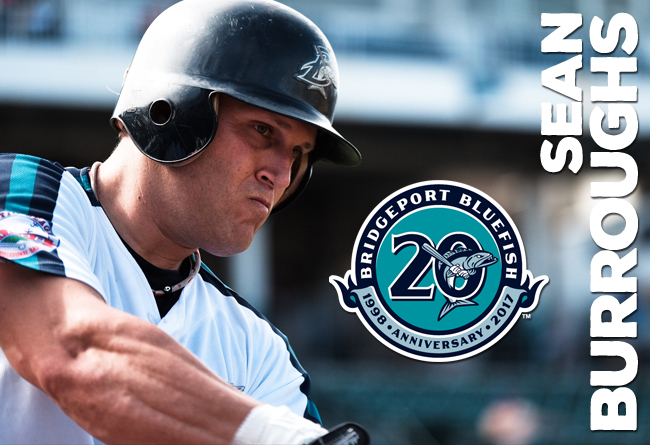 (Bridgeport, Conn., Jan. 24, 2017) – The Bridgeport Bluefish today announced that Sean Burroughs will return to Bridgeport for the 2017 season. Burroughs returns for his fourth season with the Bluefish and 16th of professional baseball. During his second year in Bridgeport in 2015, he was traded to the Long Island Ducks, also of the Atlantic League, and finished the season as the league’s batting champion with a .340 average. The former Major Leaguer came back across the pond midway through the 2016 campaign, and finished the season with a .322 batting average with one home run, 27 RBI and 39 runs scored in 81 games. The 36-year-old has played seven years in the big leagues, appearing with the San Diego Padres, Tampa Bay Devil Rays, Arizona Diamondbacks and Minnesota Twins. In 528 Major League games, he has compiled a solid .278 batting average with 187 runs scored, 68 doubles, 12 triples, 12 home runs and 143 RBI. Sean, the son of former Major Leaguer Jeff Burroughs, began his career with the San Diego Padres organization after being selected in the first round (ninth overall) of the 1998 MLB Draft. He was also named the MVP of the 2000 MLB Futures Game. Over the course of 865 minor league contests, the veteran has comprised a .314 batting average with 32 home runs, 394 RBI, and 393 runs scored.